Hello there, do you want to find out all about what Sycamore Superstars have been up to? Yes? Well you have come to the right page! In Sycamore class this year, we will always strive to do our best and follow our PART-E values and being resilient in our learning so that we can meet the goals that we have set ourselves. This is really important this year as we are the role models for the entire school. We know that younger members of our team will be looking at us to see what Bowsland Best behaviour looks like and are keen to demonstrate the Sycamore Superstars that we are every single day this year! We love our classroom as it is colourful and exciting to be in with decorations that are made by Miss Campbell and by us when we have achieved something that we are really proud of. Some of us are looking forward to returning to Sycamore, whilst others are keen to join our friendly environment and work together to support each other on our learning adventure. We know that we will therefore make new friends, even though we are in a new class. We have all already shown an amazing attitude and determination towards our learning and will continue to do so to show our teacher and others in the school what we are made of. What do our values mean for Sycamore? Pride is all about having a growth mindset to ensure that we give 100% to every piece of learning and are really proud and happy with the work we have done. Throughout our journeys in the school, we know that making the most of our marvellous mistakes will make us even better learners! Achievement – We know that there are lots of challenges coming our way this year, but working hard makes school really fun because it means that we can celebrate our own successes and see other people do well in their learning too! We will always ask for help and listen to each other so that we can achieve what we deserve to achieve and be the best kind of purple learner! Responsibility – We have lots of really exciting jobs to do this year and will ensure that as role models for the school, we take care of our resources and always model Bowsland Best behaviour! We also know that it is really important to Miss Campbell that we respect one another because we are a team. This means valuing everyone’s opinions and taking turns to share our wonderful ideas! Teamwork is such an important value for us and our school as we made up of lots of different little teams who all contribute and strengthen our huge school team. Every single one of us is unique and has something to contribute to our school, so by working together we can learn and grow with each other and this will help strengthen our friendships and succeed in our learning. Enjoyment – We have already come back to school with huge smiles on our faces and can’t wait for this to continue! There are lots of exciting topics coming up (like the Anglo-Saxons and Vikings this term) and lots of events to look forward to – running our own businesses during the Fiver Challenge, the winter singalong, class assemblies, swimming, Year 6 camp and many many more! S elf confidence and belief in ourselves will help us achieve our goals. Y ou always try and never fail in BG’s Sycamore. C ommitment – after all learning from our marvellous mistakes is when some of the greatest learning can happen! A chievement – we all want to achieve our best, using our target cards to help us progress in our learning. M aking sure all members of our team feel included and leave with a smile. O ptimism – this is the key to being a purple learner. E – together we will have a fantastic day. We are determined to share; have fun; play and work together; look out for people who may need our help and most importantly have fun this year! So keep an eye on our page so that we can show you how we plan to do so and share all of the adventures that we are having in Sycamore! This term in Computing, we have been exploring Stop Motion Animations. We had already had some practice during our trip to We the Curious, so we have enjoyed becoming experts in the field! During the last week of term, we made the backdrops for our animations; we can’t wait to use them to inform you all about how the five different types of volcanoes are formed. Stay tuned to find out more! Our Design Technology focus this term has been to “apply our understanding of how to strengthen, stiffen and reinforce more complex structures”. For our explore session, we dived into the recycling and used scrap paper to build structures and then we tested how strong they were by adding weights to them. The strongest structure held 2kg – very impressive! This has helped us with our designs for our Stop Motion Animation backdrops, which we have been making ready to film our scenes about mountain formation. A huge thank you to all the family and friends who joined us to celebrate our class assembly last Thursday. We were really proud of what we had produced and were eager to share some of our learning with you. For those of you who couldn’t make it, here is the video part for you to enjoy! As part of Anti-bullying week, we explored the word ‘Respect’ and, as a team, came up with lots of words associated the word that started with each letter. We then wrote positive comments about each other on post-it notes and celebrated that, although we are all different, this is what makes us a great team. After this, we completed a drama activity, where we looked at scenarios in school that might upset people and discussed how to work together to ensure that these don’t happen or we know how to fix them if they do. During our Learning and Lunch day, Sycamore class were all excited when we found out what we were doing. In the morning, we were joined by parents and carers to make Anglo-Saxon bread, which was delicious! We also designed little bakery bags to take this home in, using patterns from this era. In the afternoon, we were lucky enough to have more visitors who helped us conduct a science experiment. Miss Campbell is the biggest tea fan we know, but she has been forced to drink cold cups of tea! How disastrous! Using our knowledge of conductors and insulators, we investigated which material she should use as a teacup blanket; we found that the aluminium foil would be the best shout. In PHSE this week (Jigsaw), we explored the benefits of working hard and overcoming barriers in order to be successful. We discussed how, by persevering, we will feel extremely proud of what we have achieved. To illustrate this, we played the treasure game, where some bells were placed beneath a chair. Someone sat on the chair and was blindfolded, whilst somebody else had to try and steal the bells without being caught. If they were successful, we asked them how they felt and the responses were: “happy”, “proud” and “relieved”. In RE, we have been continuing to explore the topic: ‘Architecture and Creativity or Generosity and Charity’. This week, we discussed how impressive the architecture in cathedrals is and how long it would have taken to produce such an architectural masterpiece. We looked at two cathedrals which have been destroyed as a result of natural disasters and found out that these had been rebuilt in a cheaper alternative – one from cardboard and one from trees. We then participated in a decision alley, where four architects walked through the centre, whilst the rest of us tried to convince them of our opinions. The result was a tie. As a class, we believe that it is really important for people to have somewhere to go and worship their religion. Traditional cathedrals are full of historical artefacts and we all felt that there was something quite magical about walking into a building, feeling the chill and being amazed by the patterns and textures. Others felt that there was also an opportunity to get creative and make them more unique. We have started a new cycle in English, where we will be writing non-chronological reports. We were given a picture of a burial mound and asked to explore it, noting any questions that we had about it. We then discussed the difference between open and closed questions and returned to our work to make our closed questions more open. We then researched about the burial mound at Sutton Hoo and then made our questions more focussed. We came up with some fantastic ideas and are confident that our reports will be really interesting! In science, we have been investigating and exploring the properties of different materials. Over the last couple of weeks, we have been looking at reversible and irreversible changes. We came back from lunch and aliens had invaded UKS2 and left the remnants of what can only be described as alien soup! Cheeky aliens! As we knew that this was a reversible change, we were able to sieve, filter and evaporate the ingredients to get the water back. We then looked at an irreversible changes. We poured vinegar into a bottle that had baking soda in it and quickly put a balloon on top. Because of the chemical reaction that took place, the bubbles that were created because of the carbon dioxide caused the balloon to inflate. We loved investigating these changes and were really productive and excited to complete our learning afterwards. 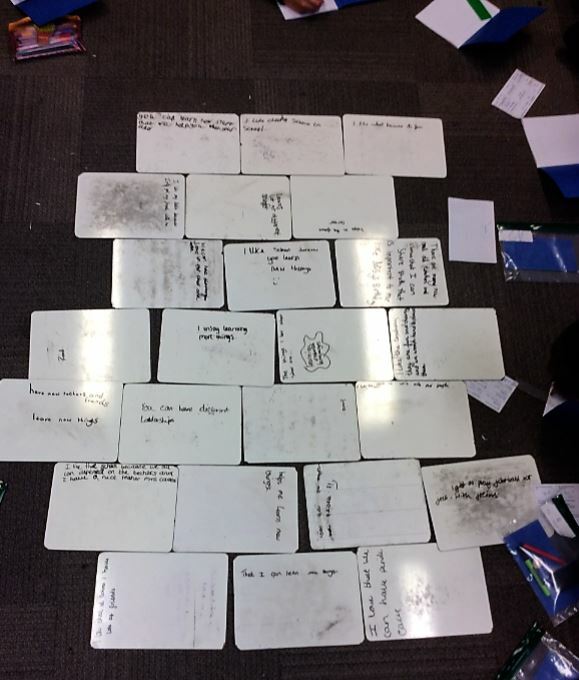 In PHSE this week (Jigsaw), we spoke about how our school is like a brick wall: stronger and sturdier together and made up of lots of really important things in our lives. Together, we made a wall, using whiteboards which contained things that were important to us like friends, learning from mistakes, being respectful. We realised that the structure of a wall is really crucial too as if bricks are put straight on top of each other, then it is not as strong as it being interlocked. This helped us see that working together and intertwining our ideas plays a massive part of one of our values: Teamwork.